Maharishi Ayurveda Jasmine Herbal Soap is produced on a purely herbal basis – with natural oils and fragrant aroma essences. It is suitable for all skin types. With a high proportion of Ayurveda herbs, including basil, and 100% naturally pure jasmine aroma oil. Experience the incomparable care of natural Ayurvedic cosmetics, harmonized to your dosha type. Precious massage oils prepared according to original formulas, gently cleansing, nourishing shower gels, and creamy body lotions—all products are composed of selected herbs and wonderfully scented natural essential oils. For holistic natural beauty and radiance. 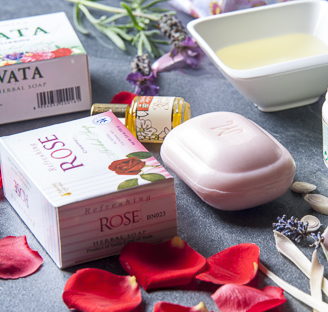 The soaps, purely plant-based, pamper with a rich creamy foam and high proportion of herbs and 100% natural essential oils. 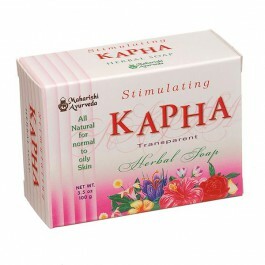 Suitable for all skin types or especially according to individual dosha type. Maharishi Ayurveda Jasmine Herbal Soap is produced on a purely herbal basis – with natural oils and fragrant aroma essences. It is suitable for all skin types. With a high proportion of Ayurveda herbs, including basil, and 100% naturally pure jasmine aroma oil. No animal testing - no artificial fragrances - all natural ingredients. 1 From real essential oil.